a-ha is a norwegian new wave band that has been globally successful since the 1980s. The trio, composed of lead vocalist Morten Harket, guitarist Paul Waaktaar-Savoy and keyboardist Magne Furuholmen, formed in 1982 and left Norway for London in order to make a career in the music business. The origin of the name a-ha comes from the lyric of an early song. After checking dictionaries in several languages, they found out that 'a-ha' was an international way of expressing recognition, with positive connotations. It was short, a-ha was easy to say and somewhat unusual. The first song to break through into the mainstream culture was "Take On Me", which was featured on the album Hunting High And Low; a main reason for its popularity was the music video that came some time later after the song's release. "Take on Me" was the first song Morten Harket heard Magne Furuholmen and Paul Waaktaar-Savoy play. At that time the song was called "Lesson One." After multiple re-recordings and two failed releases, "Take on Me" became a hit on both sides of the Atlantic in 1985. Allthough their first release of the song in 1984 was not a major success, it was remixed by producer Alan Tarney a year later, and sold 1.5 million copies worldwide in one week. Eventually the single "Take on Me" is estimated to have sold 7-9 million copies worldwide; it peaked at number one on the U.S. Billboard Hot 100 and number two in the UK Singles Chart. Sales were aided in the U.S. by a music video on MTV that mimicked the truck chase from Terry Gilliam's movie Brazil and the climactic scene from the Ken Russell film Altered States. The video used a sketchy animation / live action combination called "Rotoscoping" that tells a fantasy thriller story to the song. At the 1986 MTV Video Music Awards "Take on Me" won in six categories. It was also nominated for Best Video of the Year at 1986 American Music Awards. The follow-up single to "Take on Me" was "The Sun Always Shines on T.V.". In the U.S., the song peaked at number twenty on the Billboard Hot 100 and reached number seventeen on Radio & Records airplay chart. In addition, the music video for the song won in two categories at the 1986 MTV Video Music Awards. a-ha's American success culminated in their 1986 Grammy nomination in a coveted Best New Artist category which was eventually won by Sade. "The Sun Always Shines on TV" turned out to be A-ha's last Billboard Top 40 single, and to this day in the United States a-ha is mostly remembered by the general public only because of the singularly huge success of "Take on Me". Hunting High and Low (1985), which contained "The Sun Always Shines on TV" and "Take on Me," was a worldwide bestseller. In the U.S., it sold more than a million copies and acquired platinum certification by RIAA. As of 2005, Hunting High and Low has sold 8 million copies worldwide. a-ha's second album was Scoundrel Days (1986) and represented a move towards alternative rock as synthpop began to fall out of style. In 1987, they provided the title song for the James Bond film The Living Daylights. Stay on These Roads (1988) received more mixed reviews than the previous albums. 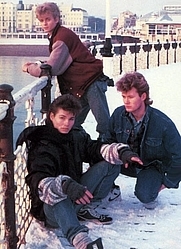 In spite of a drastic decline in sales in the next few years, a-ha continued to record two more albums, East of the Sun, West of the Moon (1990) and Memorial Beach (1993). East of the Sun, West of the Moon featured a cover version of The Everly Brothers 1963 single, "Crying in the Rain". Because of apparent internal conflicts between the band members and conflict with the record label at the time, A-ha split in 1994 and their members started focusing on solo activities, but came together in 1994 to perform for the Winter Olympics in Lillehammer, Norway. This performance included their song composed for the Winter Paralympics, "Shapes That Go Together". After a very well-received performance of "The Sun Always Shines on TV" and a new song, "Summer Moved On", at the Nobel Peace Prize Concert in 1998, the band returned to the studio and recorded 2000's Minor Earth Major Sky, which resulted in a new tour, and a videocast performance of a-ha (with Briskeby) opening the new Vallhall stadium in Oslo. Sales of this album and 2002's Lifelines showed that their fanbase was still there, and also that they were able to attract new audiences, especially in Central Europe and Scandinavia, where the albums sold extremely well. They appeared again at the Nobel Peace Prize concert in 2001. a-ha's music video for the song, "I Wish I Cared" was the first fully web-based animated flash music video to be made available. A live album (from their 2002 tour) with the title How Can I Sleep With Your Voice in My Head? was released in March of 2003, preceded by a live single of the 1986 classic "The Sun Always Shines on TV". In 2004, an in-depth book entitled "The Swing Of Things" was published, also featuring a CD of early demo material. In 2004, a-ha celebrated their twentieth anniversary with the release of a new singles collection: The Definitive Singles Collection 1984-2004. This compilation brought them back into the UK Top 20 Album Charts, where they reached number thirteen. Over their career, a-ha have officially released 32 singles. 13 of these became top ten singles in the UK, and 14 singles have been number one on the radio lists over the world. The compilation included some of the highlights from a-ha’s last 20 years. In September, a-ha returned to the U.S. (at Irving Plaza in New York City) for the band's first concert on American soil since 1986. A short impromptu performance of "Take on Me" occurred on September 11 in Times Square. On August 27, 2005, the band played a concert for 120,000 people in Frognerparken in Oslo, the largest concert ever in Norway. On November 4, 2005, the band released its new studio album, Analogue. The first single "Celice" was released on October 4 in mainland Europe. Later that same month, a tour followed, with concerts in Brussels, France, Germany and the UK. The release of the track, "Analogue (All I Want)" followed in the UK in January 2006, giving a-ha its first top ten hit in the UK since 1988. The third single in Europe (second in the UK) from the album was the Magne Furuholmen penned "Cosy Prisons", already a live-staple in the band's set. On the 30 October 2006 in London a-ha received the prestigious Q Inspiration Award for its long contribution to music and for inspiring many of their younger colleagues in the business. In 2007 a-ha recorded a cover of John Lennon's "#9 Dream" for Amnesty International. A ninth studio album, Foot Of The Mountain, was released in the summer of 2009. This more synth oriented album got a number five position in the UK in August 2009, and was No. 11 on the European album charts. Norway's most successful band through the years is splitting up for good! After 9 studio albums with over 35 million albums sold, it`s over for the band. A-ha had a press conference in Cologne 26.10.09, the day before their last world tour kick-off in Lanxess Arena. The last concert will be in Oslo Norway. The concert is on 4 December 2010 at the Oslo Spektrum. They are currently in the middle of a big wide-world tour including several stadium concerts in Norway! The tour is titled "Ending on a High Note". Photo galleries and additional information can be viewed at the official site, www.a-ha.com. Subscribe to A-Ha RSS Feed to get latest lyrics and news updates. What do you think about A-Ha? Let us know in the comments below!